Our annual Brazilian Carnaval celebration, hosted by Marcos Oliveira, is a yearly highlight. One of the most vibrant celebrations of Carnaval in the world happens every year in RIO DE JANEIRO Brazil. 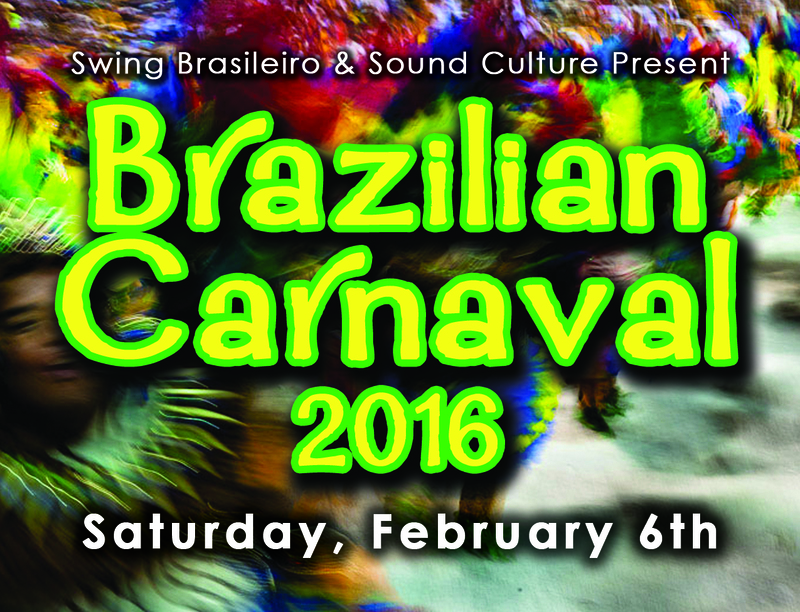 Sound Culture and Swing Brasileiro are proud to bring the tradition and vibe of Brazilian Carnaval to Chicago! The night will feature local Brazilian super group SWING BRASILEIRO which combines some of the area’s most accomplished Brazilian musicians playing popular carnaval musical styles such as Samba, Marchinhas, Samba Reggae, Frevo and Batucadas. The evening also includes Carnaval costume dance performances by the beautiful PASSISTAS SAMBA DANCERS. The night kicks off with performances by GRUPO AXE CAPOEIRA from Chicago. Capoeira is a unique, interdisciplinary Brazilian art form combining acrobatics, dance, martial arts and passionate Afro-Brazilian music and dance in beautiful costumes. Originally founded in Recife Brazil in 1982, now with chapters in over 26 countries today, GRUPO AXE CAPOEIRA is without doubt one of the world’s leading Capoeira organizations. DJ NANDO BRASIL keeps the party going throughout the night. THIS EVENT SELLS OUT EVERY YEAR! Advanced discounted tickets available while supplies last, so get your tickets early!